BEIRUT, Lebanon (CNN) -- The United States backs Lebanon's democratic process, but U.S. Vice President Joseph Biden warned Friday the United States will reconsider its assistance to the country if its next government strays from certain "fundamental principles." The powerful Shia militia group Hezbollah could lead Lebanon's government after the June 8 election, with the help of Lebanese Christian opposition leader, Gen. Michel Aoun. 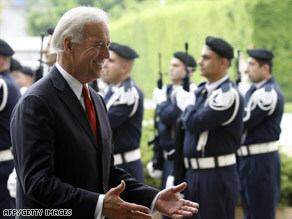 Hezbollah said Biden's visit was indicative of the United States' "meddling" in the affairs of Lebanon. "Hezbollah ... calls upon Lebanese officials, especially the president of the republic, Michel Sleiman, to raise the issues of spy networks, Israeli violations and continuing Israeli occupation to Lebanese regions," the statement said. The United States considers Hezbollah -- which is supported by both Syria and Iran -- to be a terrorist organization. It has gained more political power in Lebanon in recent years, following its perceived victory over Israel in 2006. Since then, it has been more widely perceived by its supporters to be the "defenders of Lebanon." Biden's visit comes a month after Secretary of State Hillary Clinton's trip to Beirut in which she called for an "open and free" election without outside interference -- a veiled reference to Iran and Syria. The consecutive visits by two top U.S. officials signals a concern by the new American administration that a Hezbollah victory in Lebanon could shake the foundation of President Obama's Middle East peace efforts. Obama plans to deliver a speech to the Muslim world from Cairo, Egypt, on June 4 -- just four days before Lebanon's election. Hezbollah leader Hassan Nasrallah has been speaking nearly every day in the lead-up to the June 8 election denouncing the powerlessness of the current government, and saying it is time for a change. However, part of the reason why Lebanon's government is crippled is because of concessions that it made to Hezbollah -- including giving them veto power -- in order to end a political stalemate that boiled over into violence last year. Hezbollah militants, in a blatant show of force, seized control of the streets of Beirut in May 2008, marking the worst violence to hit Lebanon since the end of its civil war in 1991. The government had to grant major political concessions to Hezbollah to restore order to Beirut. Some analysts are concerned that Hezbollah could gain more control over Lebanon's government after the upcoming vote. But Dori Chamoun, a key politician in Lebanon, warned that that assessment may be based on "rumors" and propaganda being spread by the Shiite militia and their political allies. "They [Hezbollah] think they can scare many but no one is scared," Chamoun told CNN. "They can spread all kinds of rumors on their four TV stations saying that they will win this upcoming elections, but we know who will win in two weeks. They know it too. "We are sure that we will win because we have a clear vision on how to build a better Lebanon for all." Chamoun, whose father Camille Chamoun was Lebanon's president in the 1950s, is running for a seat in parliament. Another problem for a possible Hezbollah-dominated government is working with Christian and Sunni Muslim politicians who -- under Lebanese law -- must participate in the government. Christian voters are split between supporting Aoun -- the only prominent Christian politician to support Hezbollah -- and other Christian leaders who want Hezbollah to disarm. It would also be difficult to find a Sunni political figure willing to serve as prime minister in a Hezbollah-led government since the majority of Lebanon's prominent Sunni politicians are aligned with Saad Hariri's March 14 coalition, which has declared they will not participate in any government if Hezbollah wins. Lebanon's political landscape could be shifting after a similar shift in neighboring Israel. Voters in the Jewish state overwhelmingly supported conservative parties over more moderate groups, bringing into power Prime Minister Benjamin Netanyahu earlier this year. Netanyahu is viewed in the Arab world as more hawkish than his predecessor, Ehud Olmert, who ordered the war against Hezbollah in 2006. A Hezbollah victory in Lebanon could further inflame tensions with Israel, particularly with an estimated 30,000 rockets pointed at Israel from southern Lebanon -- all under the control of Hezbollah.